Elaine and I did a painting swap :)She is soooo cool! Her journals are sooo amazing, she should make a book for real. Have you seen the painting that she made me?? It's amazing!! I am in love with her style. It's hers and it's a favorite!! So, I was super excited when she had said that she wanted to do a trade! Elaine is very recently engaged so I wanted to create a painting that would honor her engagement :) The lighting is yuck (surprise, surprise right)? I always finish projects at night and get way too excited and can't wait until the morning for a picture. Did you notice though that I usually go back and switch the pictures on my blog when I get natural lighted pics?? I'm cool like that. thank you SO much. This has been FUN! that is really good janel! I love it, Janel! 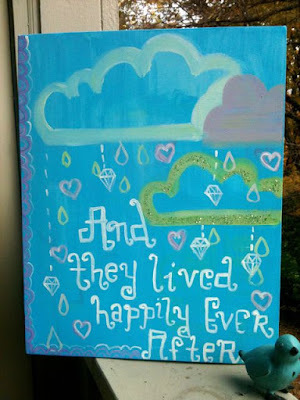 The lettering is toooooo cute, and I love the way that you used the fun color! I loved the autumn painting that you did a while back too. I think you are officially and excellent painter! i love it...i think you did a really good job! i love the diamond rain! too cute!